There is nothing so forlorn as a good picture tossed upon the scrap-heap. Worse yet is when it happens twice. Sy Weintraub was formerly in television. Viewing independent production as the great frontier, he plunged forward with partner Harvey Hayutin and purchased controlling interest in Sol Lesser Productions in April 1958 for $3.5 million. When did the independent ever have the opportunity he has today, when the industry is really bouncing? Indeed, as Weintraub mapped his first venture in association with Paramount, it seemed as though skies were the limit. It just wasn’t possible to lose money on a Tarzan picture, according to Sy, and thanks to recent acquisition of those character rights from Lesser, he was set to dive head first into a money well with Tarzan’s Greatest Adventure. We’re going to take advantage of the Summer boxoffice by putting it into release across the country on June 17 (1959), when we’ll have at least 300 prints in circulation. What happened next could not have been to Weintraub’s liking. 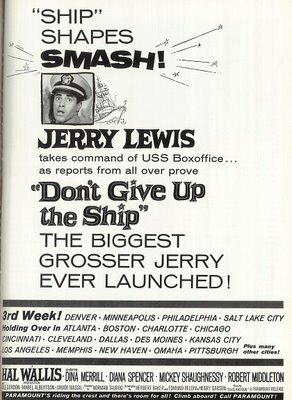 Tarzan’s Greatest Adventure opened in support of Don’t Give Up The Ship, Jerry Lewis’ latest comedy and a far more valuable asset to Paramount. Weintraub had hoped his mature approach to the renewed series would broaden its appeal to the adult audience he sought. Now his grown-up Tarzan was being dumped into the kiddie wastebin. Motion Picture Herald recognized the producer’s effort --- Fresh concept … the best Tarzan in years … bound to attract a greater segment of the adult ticket buyers. But how many of these were prepared to stand on line with a lot of screaming Jerry moppets? 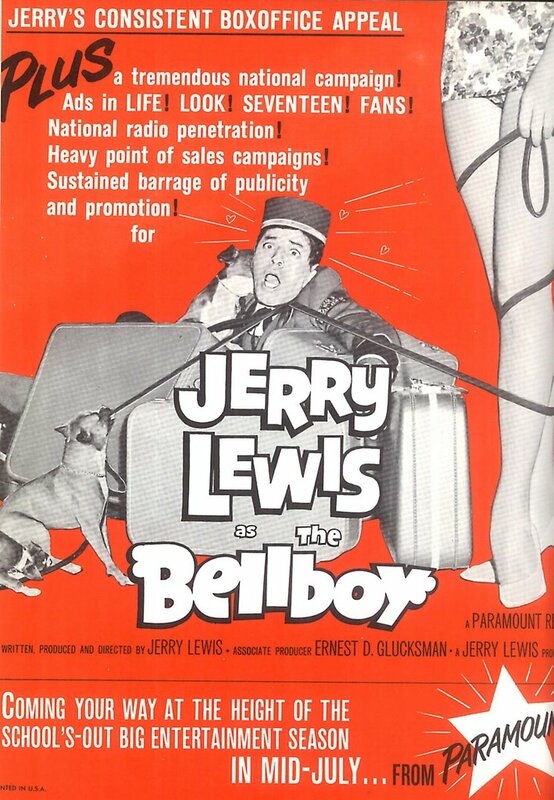 Paramount’s real investment was its relationship with Lewis (but check out a previous Greenbriar story HERE about how that relationship deteriorated later). June 1959 saw a new pact between Par and Jerry involving a minimum sum in excess of ten million. Don’t Give Up The Ship would be launched June 16 with a Navy League sponsored opening in Washington, with government officials and VIP guests in attendance. Next day it would go wide with saturation bookings across the country. NYC neighborhood double bills found Tarzan’s Greatest Adventure bringing up the rear. Not As Special As They Were Made Out To Be, read Pete Harrison’s headline in his report to exhibitors dated June 27. 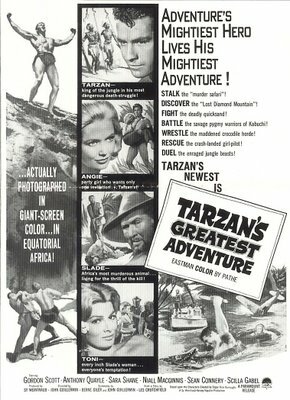 From the ballyhoo that continues to pour out of the Paramount publicity department, and from the review treatment given to the picture in several of the trade papers, one could get the impression that "Tarzan’s Greatest Adventure," which the company is releasing, is something very special. Our own review indicated that it was no more than a fair program picture of its kind. Harrison went on to damn Tarzan with faint praise, implying (correctly, as it turned out) that the company had little faith in the product. 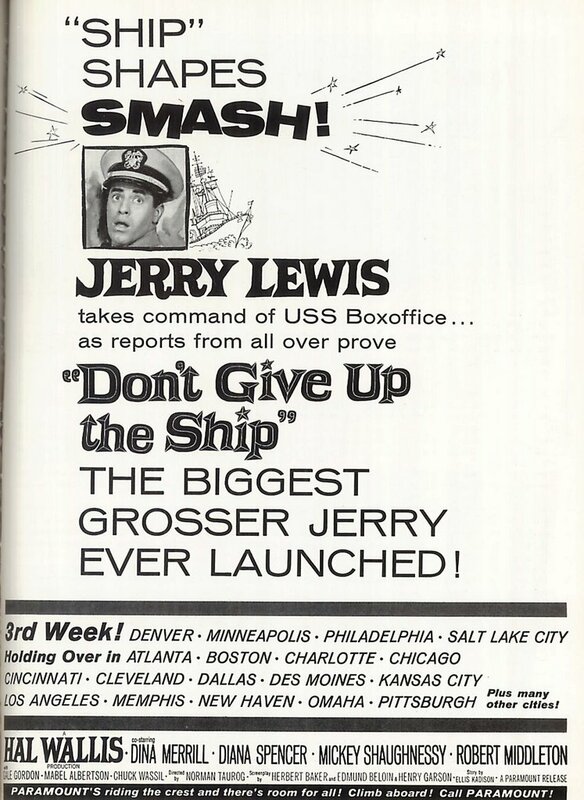 That Paramount itself shares our review opinion is evidenced by the fact that the picture skipped a first-run showing in New York City and opened instead at the Brooklyn Paramount Theatre as a supporting feature to "Don’t Give Up The Ship." Harrison also cited a "mild" notice from the New York Daily News, and warned fellow exhibitors to bear all this in mind when the Paramount salesman tries to sell you either of these pictures as something extra special (he’d given the razz to Jerry’s feature as well). Clearly Paramount was trying to extract better terms for Tarzan’s Greatest Adventure on the one hand (citing positive reviews), and unceremoniously deep-sixing it on the other. Either way, showmen were skeptical. The "warm weather blockbusters" Paramount was pushing hardest were Last Train From Gun Hill, The Five Pennies, and Lewis' picture. 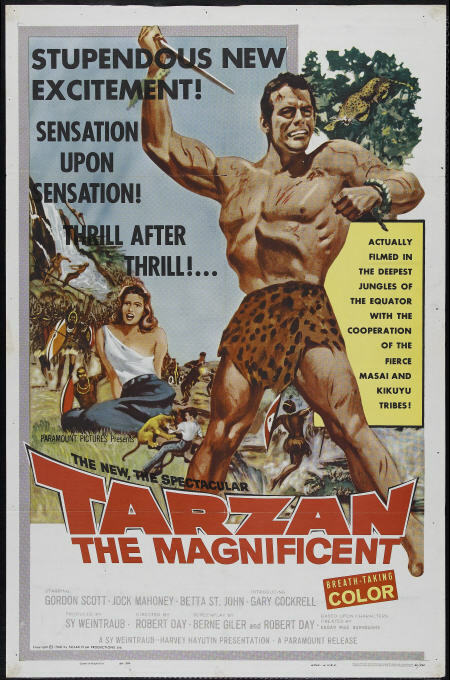 Final rentals reflected the sort of distribution politics that doomed the Tarzan show --- Don’t Give Up The Ship took a whopping $3.1 million --- Tarzan’s Greatest Adventure ended with $933,000. Down south, Tarzan got more respect. We always know great movies when we see them. 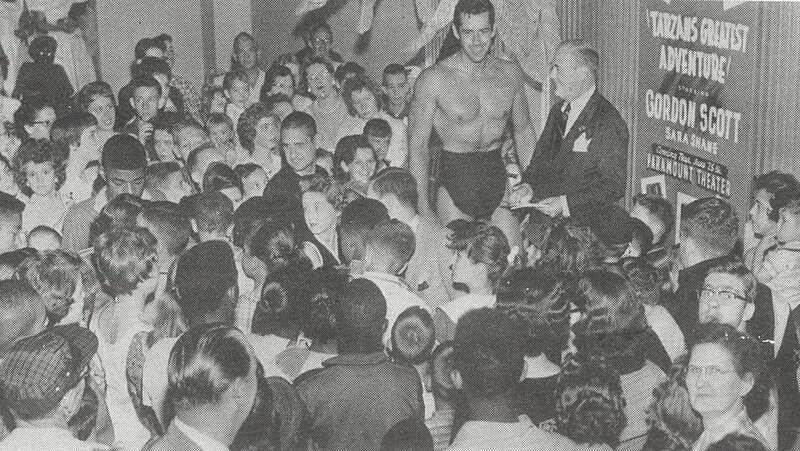 Besides that, we had the man himself --- Gordon Scott canvassed Dixie in a whirlwind tour during the latter part of June that covered Nashville, Atlanta, Little Rock, Greensboro, and dozens of smaller venues where Tarzan’s Greatest Adventure ran as a single. Our own Liberty Theatre played it solo for three days (alas, sans Gordon). According to the Motion Picture Herald, personal appearing Tarzan left fans bug-eyed with awe. The half-naked giant opened the tour in Birmingham, where he dropped in on various TV and radio personalities clad only in his loincloth, then thrilled five thousand underprivileged children at a local zoo before sharing cages with lions, monkeys, and elephants. In Durham, North Carolina, he checked out a Liggett & Myers cigarette factory. 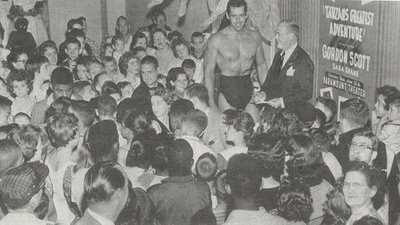 The appearance shown here was at Harvey’s Department Store in Nashville, where the jungle hero met fans and signed autographs. An acquaintance of mine encountered Scott in Lexington, NC and still remembers that day. I only wish I’d asked Gordo about his tour the couple of times I spoke with him at Courts shows back in the nineties. 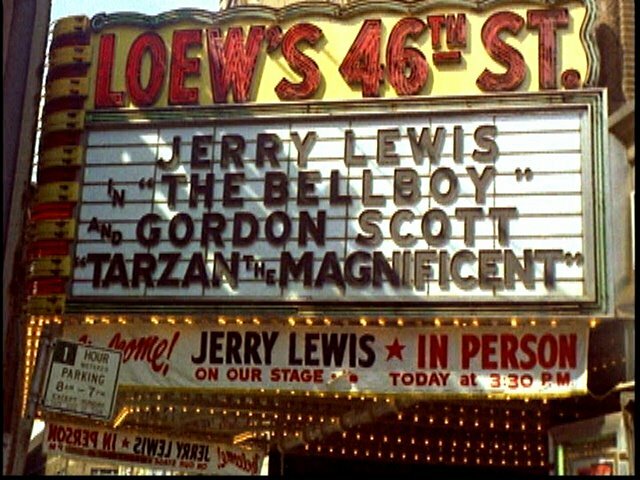 If Paramount was at all chastened over their shabby treatment of Tarzan’s Greatest Adventure, they clearly took no steps to atone the following summer, for July 1960 found Tarzan the Magnificent occupying yet another lower berth, and again with Jerry Lewis! 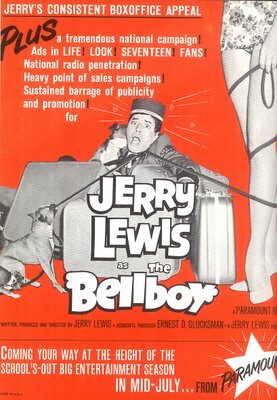 This time it was The Bellboy in first position, Jerry’s biggest earner up to that time ($3.4 million), and as before it was a saturation opening. Two days of personal appearances at eighteen NYC Loews houses brought Lewis before an ocean of juve fans, and somewhere at the bottom of those marquees (as shown here) was Tarzan the Magnificent. Audiences couldn’t help feeling a sense of déjà vu as they filed into a double feature seemingly identical to the one they’d experienced the previous summer holiday. There was a difference, however, but not a favorable one. Tarzan The Magnificent was significantly down from Greatest Adventure, with $679,000 the extent of domestic rentals for Sy Weintraub’s second producing effort. Clearly the adult spin on Tarzan wasn’t working. Weintraub would adopt a kid-friendlier approach when he took the series to MGM (native boy sidekicks, comical baby elephants, etc.). Paramount’s thoughtless and indifferent handling had scuttled a pair of gallant attempts at a literate, first-quality Tarzan. I don’t know how these pictures might have fared with a dedicated campaign, but I do know they deserved better than they got. A number of kids had their first adult movie-going experience watching these. Many recall them yet as the best chapters in the whole Tarzan series. Finally catching them myself in the late seventies, I was blown away. 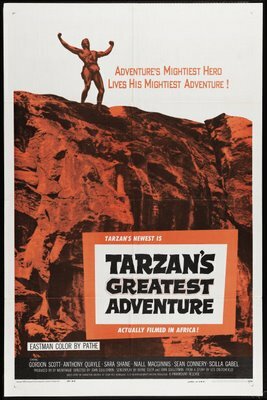 Tarzan’s Greatest Adventure and Tarzan The Magnificent never play down to their audience. Kids were no doubt flattered by two movies that for once gave them credit as thinking viewers --- and just look at those supporting casts! Between the two, there’s Anthony Quayle, Niall MacGinnis, Sean Connery, John Carradine, Lionel Jeffries, Jock Mahoney --- fantastic people --- and don’t let anyone mislead you as to Gordon Scott’s prowess in the title role. 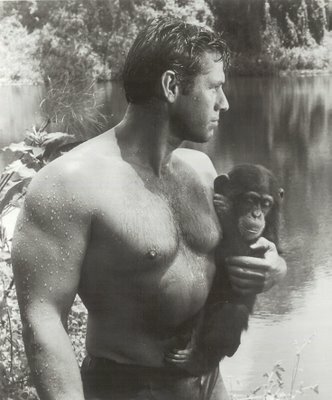 He is just great --- hands down the finest Tarzan yet put to film. I do so wish these pictures could arrive on DVD (they just have, via Warners Archive). Zero comments for Gordon Scott? Well then, I'll have to step up and commend you for acknowledging the best of all screen Tarzans and the best of all Tarzan movies. Love the shot of Scott making a promotional appearance in costume! Is there one actor today with the self-confidence to make a public appearance in a loincloth? I blogged about Scott and his Tarzan movies once before and can't imagine why they're not more revered. I did try with a friend's help to try to interest Paramount in releasing these, with me providing audio commentary, but apparently the rights do reside elsewhere. The Scott Tarzans would make a fabulous box set, and actually so would the Jock Mahoneys (the most picturesque of the series) and Mike Henrys (his first, TARZAN AND THE VALLEY OF GOLD, is good widescreen fun). Maybe after Warners gets through the RKO Weissmullers and Lex Barkers, we'll get them. May we all live to see it happen! Whew, Thanks Tim. I'm glad someone stepped forward on Gordon's behalf. These great pictures have been out of circulation much too long. No one to my knowledge has played them since a scattered few runs on Cinemax three or so years ago. John, I've been reading your posts for some time now and have found them to be very interesting and very informative. Thanks for being here. 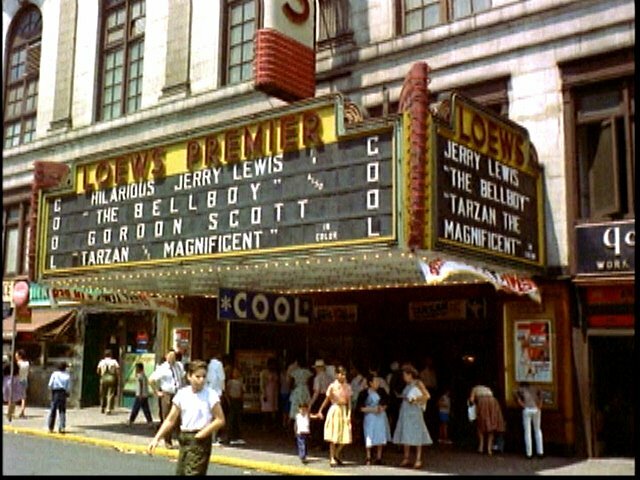 I remember seeing both of these Tarzan movies at my neighborhood theater kiddy matinee with I was a child along with the Jock Mahoney and Mike Henry ones. I may have been only ten years old but even I could tell that the ones with Gordon Scott were the more grown-up movies. I don't remember the plots of either movie but I do remember being totally absorbed by them both. Two of the best Tarzan movies I have ever seen. 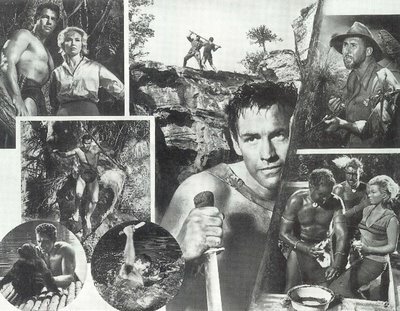 I am a Tarzan movie collector and own all six of Gordon Scott's. To bad they are only available from ebay and overseas.